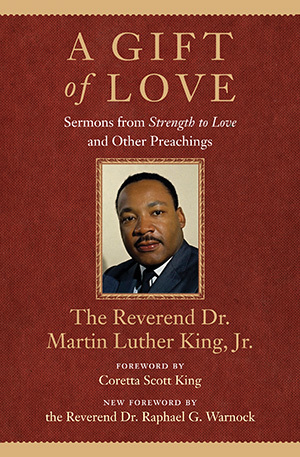 As Dr. King prepared for the Birmingham campaign in early 1963, he drafted the final sermons for Strength to Love, a volume of his most best-known homilies. King had begun working on the sermons during a fortnight in jail in July 1962. While behind bars, he spent uninterrupted time preparing the drafts for works such as “Loving Your Enemies” and “Shattered Dreams,” and he continued to edit the volume after his release. A Gift of Love includes these classic sermons, along with two new preachings. Collectively they present King’s fusion of Christian teachings and social consciousness, and promote his prescient vision of love as a social and political force for change. Probably no admonition of Jesus has been more difficult to follow than the command to “love your enemies.” Some men have sincerely felt that its actual practice is not possible. It is easy, they say, to love those who love you, but how can one love those who openly and insidiously seek to defeat you? Others, like the philosopher Nietzsche, contend that Jesus’ exhortation to love one’s enemies is testimony to the fact that the Christian ethic is designed for the weak and cowardly, and not for the strong and courageous. Jesus, they say, was an impractical idealist. In spite of these insistent questions and persistent objections, this command of Jesus challenges us with new urgency. Upheaval after upheaval has reminded us that modern man is traveling along a road called hate, in a journey that will bring us to destruction and damnation. Far from being the pious injunction of a Utopian dreamer, the command to love one’s enemy is an absolute necessity for our survival. Love even for enemies is the key to the solution of the problems of our world. Jesus is not an impractical idealist: he is the practical realist. I am certain that Jesus understood the difficulty inherent in the act of loving one’s enemy. He never joined the ranks of those who talk glibly about the easiness of the moral life. He realized that every genuine expression of love grows out of a consistent and total surrender to God. So when Jesus said “Love your enemy,” he was not unmindful of its stringent qualities. Yet he meant every word of it. Our responsibility as Christians is to discover the meaning of this command and seek passionately to live it out in our daily lives. Let us be practical and ask the question, How do we love our enemies First, we must develop and maintain the capacity to forgive. He who is devoid of the power to forgive is de- void of the power to love. It is impossible even to begin the act of loving one’s enemies without the prior acceptance of the necessity, over and over again, of forgiving those who inflict evil and injury upon us. It is also necessary to realize that the forgiving act must always be initiated by the person who has been wronged, the victim of some great hurt, the recipient of some tortuous injustice, the absorber of some terrible act of oppression. The wrongdoer may request forgiveness. He may come to himself, and, like the prodigal son, move up some dusty road, his heart palpitating with the de- sire for forgiveness. But only the injured neighbor, the loving father back home, can really pour out the warm waters of forgiveness. Forgiveness does not mean ignoring what has been done or putting a false label on an evil act. It means, rather, that the evil act no longer remains as a barrier to the relation- ship. Forgiveness is a catalyst creating the atmosphere necessary for a fresh start and a new beginning. It is the lifting of a burden or the cancelling of a debt. The words “I will forgive you, but I’ll never forget what you’ve done” never explain the real nature of forgiveness. Certainly one can never forget, if that means erasing it totally from his mind. But when we forgive, we forget in the sense that the evil deed is no longer a mental block impeding a new relationship. Likewise, we can never say, “I will forgive you, but I won’t have anything further to do with you.” Forgiveness means reconciliation, a coming together again. Without this, no man can love his enemies. The degree to which we are able to forgive determines the degree to which we are able to love our enemies. This simply means that there is some good in the worst of us and some evil in the best of us. When we discover this, we are less prone to hate our enemies. When we look beneath the surface, beneath the impulsive evil deed, we see within our enemy-neighbor a measure of goodness and know that the viciousness and evilness of his acts are not quite representative of all that he is. We see him in a new light. We recognize that his hate grows out of fear, pride, ignorance, prejudice, and misunderstanding, but in spite of this, we know God’s image is ineffably etched in his being. Then we love our enemies by realizing that they are not to- tally bad and that they are not beyond the reach of God’s redemptive love. Third, we must not seek to defeat or humiliate the enemy but to win his friendship and understanding. At times we are able to humiliate our worst enemy. Inevitably, his weak moments come and we are able to thrust in his side the spear of defeat. But this we must not do. Every word and deed must contribute to an understanding with the enemy and release those vast reservoirs of goodwill which have been blocked by impenetrable walls of hate. The meaning of love is not to be confused with some sentimental outpouring. Love is something much deeper than emotional bosh. Perhaps the Greek language can clear our confusion at this point. In the Greek New Testament are three words for love. The word eros is a sort of aesthetic or romantic love. In the Platonic dialogues eros is a yearning of the soul for the realm of the divine. The second word is philia, a reciprocal love and the intimate affection and friendship between friends. We love those whom we like, and we love because we are loved. The third word is agape, understanding and creative, redemptive goodwill for all men. An overflowing love which seeks nothing in return, agape is the love of God operating in the human heart. At this level, we love men not because we like them, nor because their ways appeal to us, nor even because they possess some type of divine spark; we love every man because God loves him. At this level, we love the person who does an evil deed, although we hate the deed that he does. Now we can see what Jesus meant when he said, “Love your enemies.” We should be happy that he did not say, “Like your enemies.” It is almost impossible to like some people. “Like” is a sentimental and affectionate word. How can we be affectionate toward a person whose avowed aim is to crush our very being and place innumerable stumbling blocks in our path? How can we like a person who is threatening our children and bombing our homes? That is impossible. But Jesus recognized that love is greater than like. When Jesus bids us to love our enemies, he is speaking neither of eros nor philia; he is speaking of agape, understanding and creative, redemptive goodwill for all men. Only by following this way and responding with this type of love are we able to be children of our Father who is in heaven. Let us move now from the practical how to the theoretical why: Why should we love our enemies? The first reason is fairly obvious. Returning hate for hate multiplies hate, adding deeper darkness to a night already devoid of stars. Dark- ness cannot drive out darkness; only light can do that. Hate cannot drive out hate; only love can do that. Hate multiplies hate, violence multiplies violence, and toughness multi- plies toughness in a descending spiral of destruction. So when Jesus says “Love your enemies,” he is setting forth a profound and ultimately inescapable admonition. Have we not come to such an impasse in the modern world that we must love our enemies--or else? The chain reaction of evil--hate begetting hate, wars producing more wars--must be broken, or we shall be plunged into the dark abyss of annihilation. Another reason why we must love our enemies is that hate scars the soul and distorts the personality. Mindful that hate is an evil and dangerous force, we too often think of what it does to the person hated. This is understandable, for hate brings irreparable damage to its victims. We have seen its ugly consequences in the ignominious deaths brought to six million Jews by a hate-obsessed madman named Hitler, in the unspeakable violence inflicted upon Negroes by bloodthirsty mobs, in the dark horrors of war, and in the terrible indignities and injustices perpetrated against millions of God’s children by unconscionable oppressors. But there is another side which we must never overlook. Hate is just as injurious to the person who hates. Like an unchecked cancer, hate corrodes the personality and eats away its vital unity. Hate destroys a man’s sense of values and his objectivity. It causes him to describe the beautiful as ugly and the ugly as beautiful, and to confuse the true with the false and the false with the true. Dr. E. Franklin Frazier, in an interesting essay entitled “The Pathology of Race Prejudice,” included several examples of white persons who were normal, amiable, and con- genial in their day-to-day relationships with other white persons but when they were challenged to think of Negroes as equals or even to discuss the question of racial injustice, they reacted with unbelievable irrationality and an abnormal unbalance. This happens when hate lingers in our minds. Psychiatrists report that many of the strange things that hap- pen in the subconscious, many of our inner conflicts, are rooted in hate. They say, “Love or perish.” Modern psychology recognizes what Jesus taught centuries ago: hate divides the personality and love in an amazing and inexorable way unites it. A third reason why we should love our enemies is that love is the only force capable of transforming an enemy into a friend. We never get rid of an enemy by meeting hate with hate; we get rid of an enemy by getting rid of enmity. By its very nature, hate destroys and tears down; by its very nature, love creates and builds up. Love transforms with redemptive power. Lincoln tried love and left for all history a magnificent drama of reconciliation. When he was campaigning for the presidency one of his arch-enemies was a man named Stan- ton. For some reason Stanton hated Lincoln. He used every ounce of his energy to degrade him in the eyes of the public. So deep rooted was Stanton’s hate for Lincoln that he uttered unkind words about his physical appearance, and sought to embarrass him at every point with the bitterest diatribes. But in spite of this Lincoln was elected President of the United States. Then came the period when he had to select his cabinet, which would consist of the persons who would be his most intimate associates in implementing his program. He started choosing men here and there for the various secretaryships. The day finally came for Lincoln to select a man to fill the all-important post of Secretary of War. Can you imagine whom Lincoln chose to fill this post? None other than the man named Stanton. There was an immediate uproar in the inner circle when the news began to spread. Adviser after adviser was heard saying, “Mr. President, you are making a mistake. Do you know this man Stanton? Are you familiar with all of the ugly things he said about you? He is your enemy. He will seek to sabotage your program. Have you thought this through, Mr. President” Mr. Lincoln’s answer was terse and to the point: “Yes, I know Mr. Stanton. I am aware of all the terrible things he has said about me. But after looking over the nation, I find he is the best man for the job.” So Stanton became Abraham Lincoln’s Secretary of War and rendered an invaluable service to his nation and his President. Not many years later Lincoln was assassinated. Many laudable things were said about him. Even today millions of people still adore him as the greatest of all Americans. H. G. Wells selected him as one of the six great men of history. But of all the great statements made about Abraham Lincoln, the words of Stanton remain among the greatest. Standing near the dead body of the man he once hated, Stanton referred to him as one of the greatest men that ever lived and said “he now belongs to the ages.” If Lincoln had hated Stanton both men would have gone to their graves as bitter enemies. But through the power of love Lincoln transformed an enemy into a friend. It was this same attitude that made it possible for Lincoln to speak a kind word about the South during the Civil War when feeling was most bitter. Asked by a shocked bystander how he could do this, Lincoln said, “Madam, do I not destroy my enemies when I make them my friends” This is the power of redemptive love. We must hasten to say that these are not the ultimate reasons why we should love our enemies. An even more basic reason why we are commanded to love is expressed explicitly in Jesus’ words, “Love your enemies . . . that ye may be children of your Father which is in heaven.” We are called to this difficult task in order to realize a unique relationship with God. We are potential sons of God. Through love that potentiality becomes actuality. We must love our enemies, because only by loving them can we know God and experience the beauty of his holiness. The relevance of what I have said to the crisis in race relations should be readily apparent. There will be no permanent solution to the race problem until oppressed men develop the capacity to love their enemies. The darkness of racial injustice will be dispelled only by the light of forgiving love. For more than three centuries American Negroes have been battered by the iron rod of oppression, frustrated by day and bewildered by night by unbearable injustice, and burdened with the ugly weight of discrimination. Forced to live with these shameful conditions, we are tempted to be- come bitter and to retaliate with a corresponding hate. But if this happens, the new order we seek will be little more than a duplicate of the old order. We must in strength and humility meet hate with love. Of course, this is not practical. Life is a matter of getting even, of hitting back, of dog eat dog. Am I saying that Jesus commands us to love those who hurt and oppress us? Do I sound like most preachers--idealistic and impractical? Maybe in some distant Utopia, you say, that idea will work, but not in the hard, cold world in which we live. My friends, we have followed the so-called practical way for too long a time now, and it has led inexorably to deeper confusion and chaos. Time is cluttered with the wreck- age of communities which surrendered to hatred and violence. For the salvation of our nation and the salvation of mankind, we must follow another way. This does not mean that we abandon our righteous efforts. With every ounce of our energy we must continue to rid this nation of the incubus of segregation. But we shall not in the process relinquish our privilege and our obligation to love. While abhorring segregation, we shall love the segregationist. This is the only way to create the beloved community. Jesus shall reign where’er the sun Does his successive journeys run; His kingdom stretch from shore to shore, Till moon shall wax and wane no more. In Christ there is no East or West, In Him no South or North, But one great Fellowship of Love Throughout the whole wide earth. Jesus is eternally right. History is replete with the bleached bones of nations that refused to listen to him. May we in the twentieth century hear and follow his words-- before it is too late. May we solemnly realize that we shall never be true sons of our heavenly Father until we love our enemies and pray for those who persecute us.